Hive World Terra Forums • View topic - Who has the best chances to win?? Who has the best chances to win?? Re: Who has the best chances to win?? the machine god is actually the void dragon one of the last four surviving four C'tan in the eldar mythology, and there are hundreds of thousands of necrons in comparison to shear numbers of humanity there hardly a threat until the C'tan wake, Also the eldar using the infinity circuit believe that the only hope for the survival of the galaxy depends on humanity..... any who back on track. 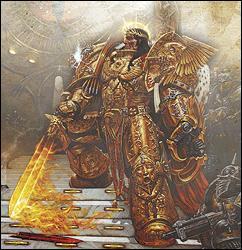 The Eldar may be willing to give away the secrets of the Black Library to humans, but are the humans fully capable of wielding them and would it do enough against the entire force of the Immaterium?